BRANDON, SOUTH DAKOTA, April 15, 2019 – Eligible farmer-owners of the CHS retail business based out of Brandon, South Dakota, shared in the recent distribution of cash patronage and equity based on business done with the co-op. This locally based retail division of CHS Inc. allocated a total of $7,608,217.06 in patronage dividends to its eligible members based on business done Sept. 1, 2017 – Aug. 31, 2018, of which $1,344,372.01 is being paid out in cash. Overall, CHS Inc. will return $150 million in cash patronage and equity redemption to its farmer-owners in 2019, part of the cooperative’s commitment to sharing profits with our owners and returning money to rural America where it can be reinvested in the community. More than 840 local cooperatives and 25,000 farmers share in this distribution of cash patronage and equity redemptions. The percentage returned to owners is determined annually by the CHS Board of Directors and based on performance, financial strength and long-term growth opportunities. In the past 12 years, CHS has returned about $3.6 billion to its owners in the form of cash patronage. The Brandon-based retail business delivers agronomy, energy, feed and grain products and services to South Dakota, Minnesota and Nebraska ag producers and other customers from 22 locations. It is part of CHS Inc., a leading global agribusiness owned by farmers, ranchers and cooperatives across the United States. 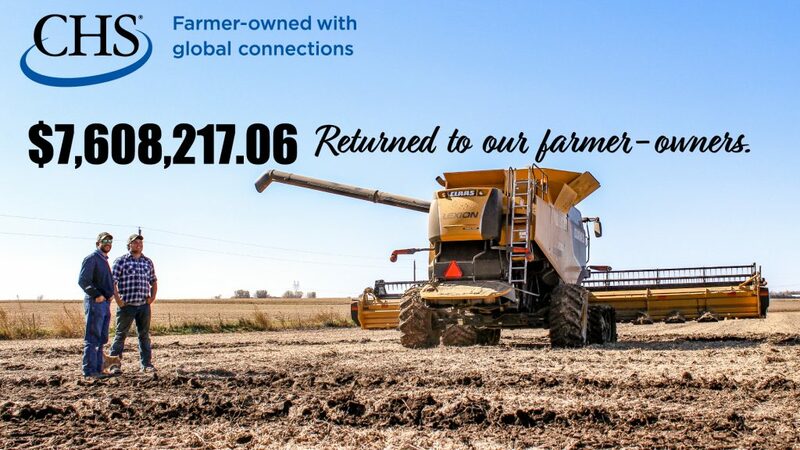 Diversified in energy, agronomy, grains and foods, CHS is committed to helping its customers, farmer-owners and other stakeholders grow their businesses through its domestic and global operations. CHS supplies energy, crop nutrients, grain marketing services, animal feed, food and food ingredients along with financial and risk management services. The company operates petroleum refineries/pipelines and manufactures, markets and distributes Cenex® brand refined fuels, lubricants, propane and renewable energy products.